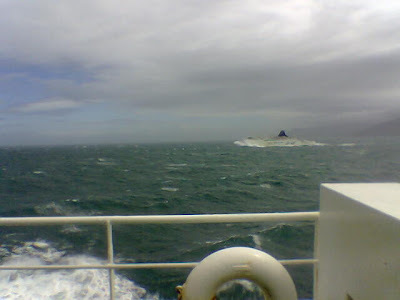 Last travelling post, a photo of the Arahura passing us in the Bluebridge sailing into Wellington. It was rough sailing with a few turning stomaches. 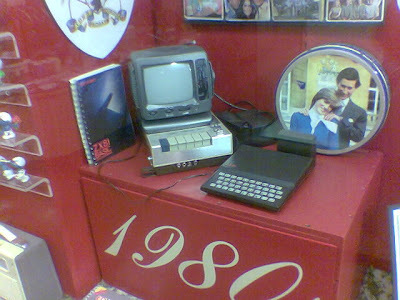 A Sinclair ZX81 at the Ashburton Museum. This one is particularly flash as it has the 18kb booster pack on the back of the touch-sensitive keypad. I spent more time looking for the syntax errors in the programmes than actually playing them, but they were good to learn on. 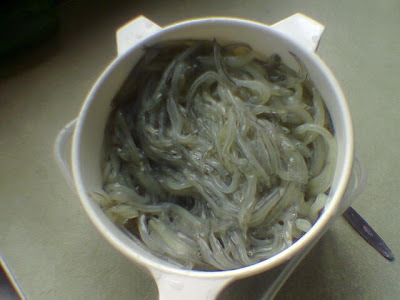 Whitebait at the rele's place, all ready to become fritters, Wanaka. Our Lady of Peace Catholic church in Roxborough, diagonally opposite Jimmy's Pies, one of the best pie shops in NZ. I think his is one of the first en plein air crucifix (with corpus) I've seen in NZ. 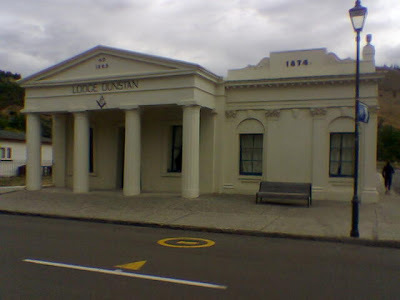 Lodge Dunstan at Clyde, right by the dam. The main door at the front is in the shape of an elongated Isosceles trapezium, I'm guessing to mimic the shape of many Egyptian building entrances. Me in Gore. 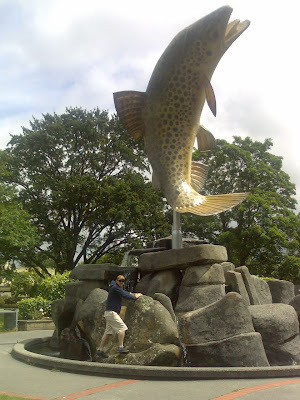 Up towards Twizel, or somewhere around them parts, there's another large model of a trout or salmon. I'm not sure which one came first. A weird sign in Riverton. 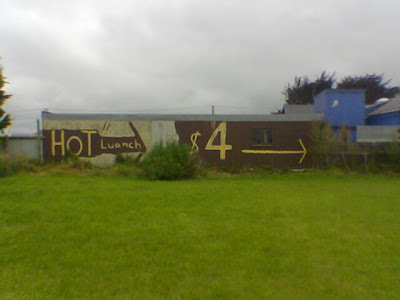 Besides the obvious spelling mistake, the arrow points to a fenced grassy paddock. 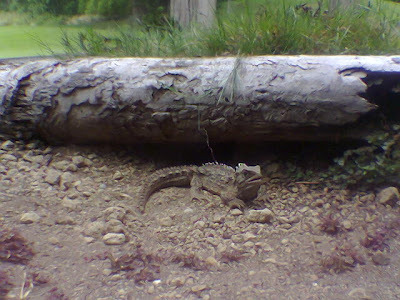 This is Henry, a 112 year old tuatara at the Southland Museum and Art Gallery in Invercargill. Not usually active during the day, Henry decided to come out of his den and do a little performance especially for us. A bit of a ladies man, Henry lives in his enclosure with three girlfriends. 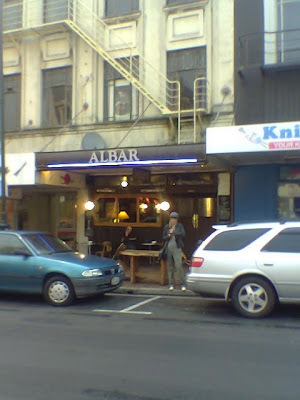 In Dunedin, just down Stuart Street from the Octagon is Albar. A quality bar, small and quiet with Emersons on tap, along with two hand-pull beers on tap. Quality. My cousin Stephen is a duty manager there. 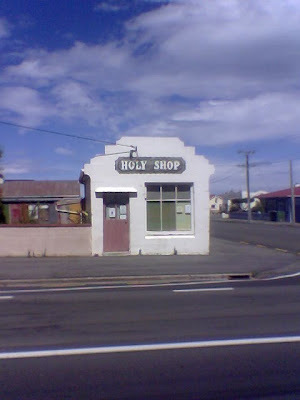 One of my favourite shops in the South Island- The Holy Shop opposite St Paul's Basilica in Oamaru.